The best flour for a lighter, more tender muffin texture. The flour used by bakeries. These are ideal for adding ingredients as the mixer is running. They are dripless and dishwasher safe. This is another tool that gets lots of use in my kitchen. In this recipe, I used it for combining the dry ingredients before mixing them into the batter. This 5-qt. mixer gets so much use in my kitchen. It comes with a glass bowl with handy measurements. I added a stainless steel bowl; it's nice to have both. This durable rack is perfect for cooling the baked muffins along with other baked goods. It conveniently fits inside a half-sheet pan, turning it into a roasting pan. Oven and dishwasher safe. When making cherry muffins, this handy gadget pops the pits out of cherries in one quick motion. This spice blend adds essential flavor to pumpkin muffins. 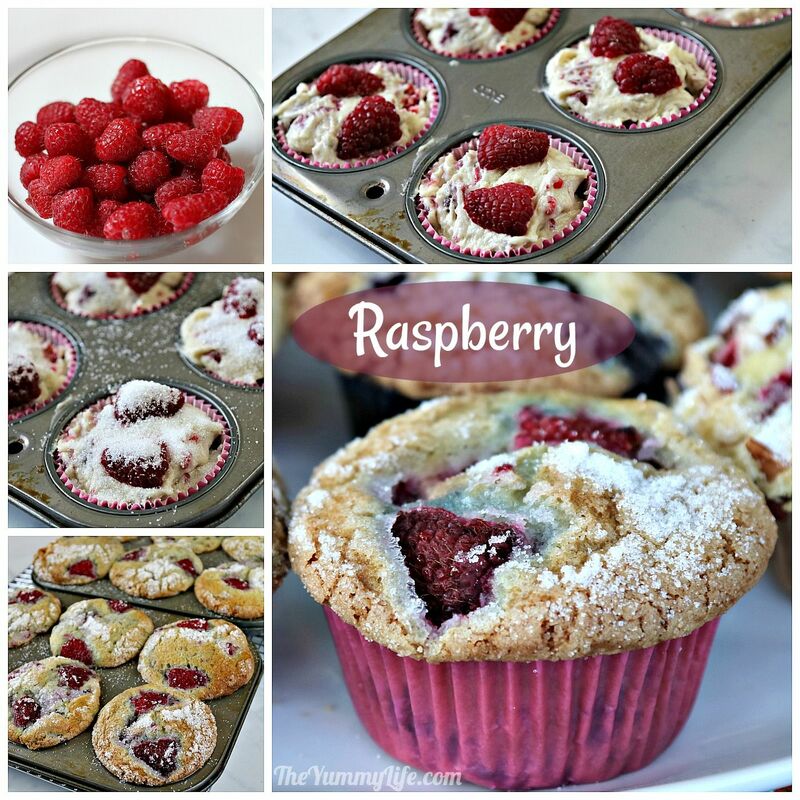 The only muffin recipe you'll ever need! Blueberry, pumpkin, banana, cherry, cranberry, peach, raspberry, apple and more. One batter, endless varieties.The most tender, delicious muffins. Blueberry, Pumpkin, Banana, Cherry, Cranberry, Peach, Raspberry, Apple, and more! 1/2 cup nuts (optional), chopped walnuts or pecans, sliced almonds, etc. BEFORE YOU BEGIN, read through all of the directions, making sure to read modifications for the specific kind of fruit you will be using. Preheat oven to 375 degrees. Grease or spray 12-cup regular muffin pan (or 24-cup mini muffin pan); or line each one with a paper cup. 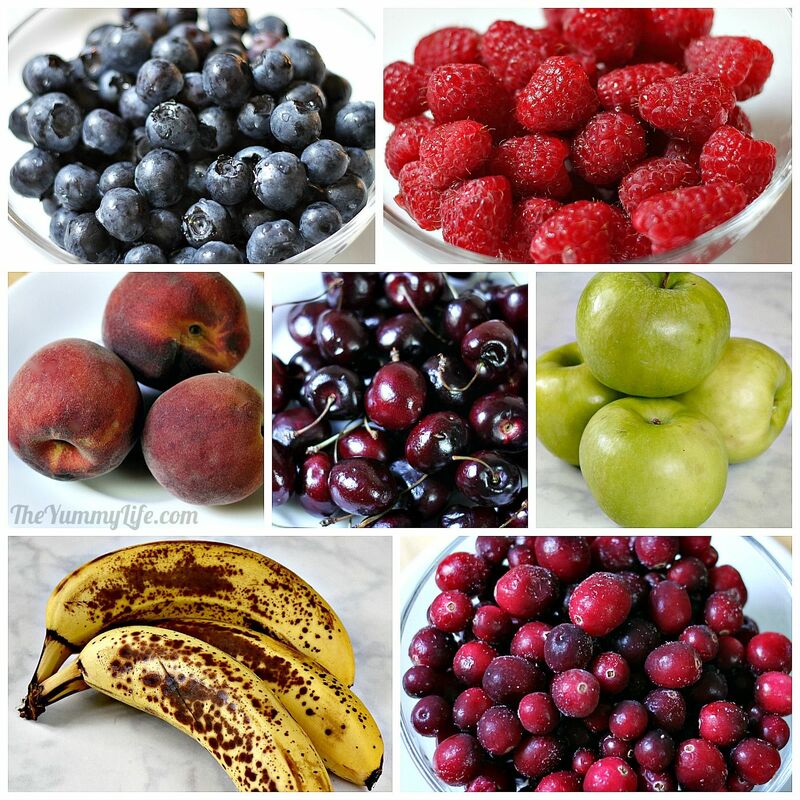 PREP FRUIT* -- see specific directions below for amounts and prep of each fruit. COMBINE DRY INGREDIENTS: In medium bowl, whisk together flour, baking powder, baking soda, and salt; set aside. COMBINE WET INGREDIENTS: In large bowl, with electric mixer on medium-low speed beat butter and sugar on until light. Add eggs one at a time, beating after each addition. Add vanilla; beat to combine. ADD FRUIT TO BATTER: Gently fold in fruit*, just until evenly combined. 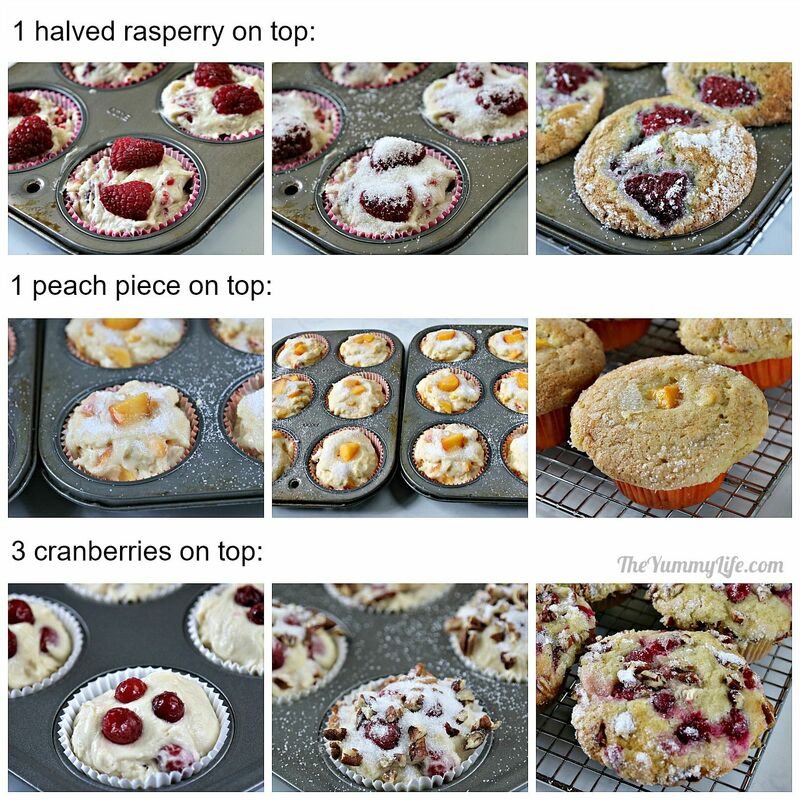 FILL MUFFIN CUPS: Use a scoop or small measuring cup to evenly distribute batter in prepared muffin pan. Batter will fill each cup, slightly mounded above top. Sprinkle top of each muffin with nuts (optional), then sprinkle on 1 teaspoon sugar. BAKE MUFFINS: Bake muffins for 25-30 minutes until slightly golden on top and a toothpick inserted in a center muffin comes out clean. (Reduce time to 15-20 minutes for mini muffins.) Leave in pan for 5 minutes before transferring to wire rack to cool completely. BLUEBERRIES: Use 2-1/2 cups blueberries. Mash 1/2 cup blueberries with fork, leaving remaining 2 cups whole. Fold into batter. RASPBERRIES & BLACKBERRIES: Gently fold 2-1/2 cups whole berries into batter. (These berries are fragile and some will break apart as they are folded in, so there's no need to mash any of them in advance.) If blackberries are large, cut each one in half before folding into batter. PEACHES, NECTARINES, APRICOTS, or CHERRIES - To dry ingredients add 1/2 teaspoon cinnamon; in wet ingredient mixture, substitute 1/2 teaspoon almond extract for the vanilla. Measure total of 2-1/2 cups unpeeled, pitted, chopped fruit. Mash 1/2 cup of the fruit with a fork, or diced it with a knife if it's too firm to easily mash. Fold chopped and mashed/diced fruit into batter. Optional nuts: add 1/2 cup sliced almonds to tops of muffins before sprinkling tops with sugar. APPLE - Use 3 cups unpeeled, chopped Granny Smith Apples. Precook apples for better flavor and texture: In skillet over med-high heat melt 2 tablespoons butter, add apples, 2 tablespoons brown sugar, and 3/4 teaspoon cinnamon; cook for 9-10 minutes, stirring often, until liquid has evaporated and apples are browned; set aside to cool for at least 10 minutes. Mash 1/2 cup cooked apples with a fork. Fold mashed and unmashed apples into batter. For sugar topping: combine 2 tablespoons granulated sugar, 2 tablespoons brown sugar, 1/4 teaspoon cinnamon; sprinkle on top of batter in muffin cups. BANANA - Add 1/2 teaspoon cinnamon and 1/4 teaspoon nutmeg to dry ingredients. Fold 2 cups mashed, ripe bananas (3-4 bananas) into batter. 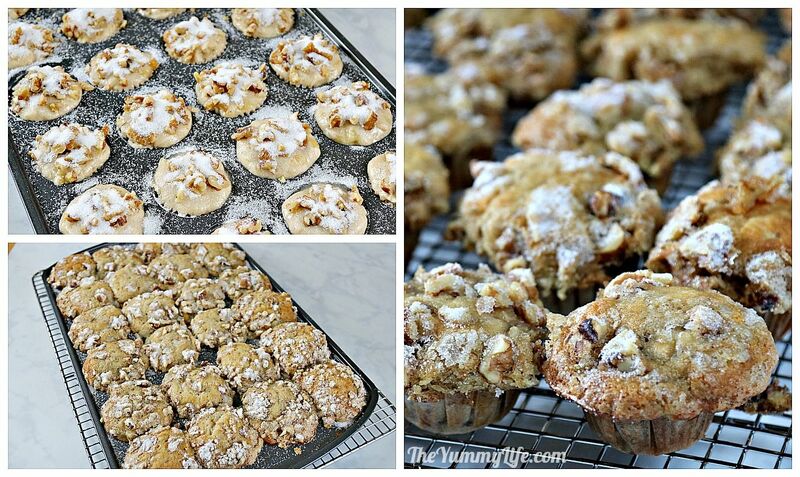 Optional nuts: add 1/2 cup chopped walnuts to tops of muffins before sprinkling tops with sugar. CRANBERRY - Measure 2-1/2 cups cranberries. Mash 1/2 cup with a fork, or dice with a knife. Combine remaining 2 cups whole along with mashed/diced cranberries, with zest from one orange (optional) and 1/4 cup sugar; set aside to macerate 30 minutes before folding into batter. Optional nuts: add 1/2 cup chopped pecans to tops of muffins before sprinkling tops with sugar. 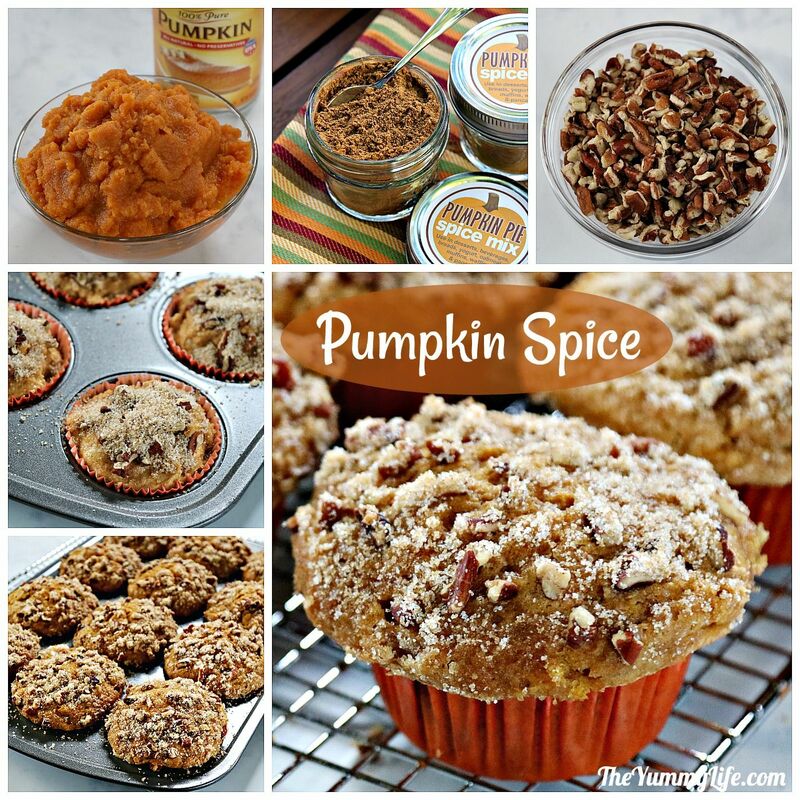 PUMPKIN SPICE - To dry ingredients add 1 tablespoon pumpkin pie spice. After adding eggs to wet ingredients, mix in 1 (15 oz) can or 1-3/4 cups plain pureed pumpkin; proceed to combine wet and dry ingredients with buttermilk per main instructions. For topping muffins: 1/2 cup chopped pecans (optional). For sugar topping: combine 2 tablespoons granulated sugar, 2 tablespoons brown sugar, 1/4 teaspoon pumpkin pie spice; sprinkle on top of each muffin. 1. STORE muffins uncovered, or inside a pourous container like a cardboard box, paper bag, or on an unsealed platter or pan with paper or dish towel draped over top. DO NOT store in sealed container to prevent sweating that will make muffins soggy. Muffins are still good the second day if stored properly. 2. If using frozen berries, allow them to thaw, rinse, drain, and pat dry with paper towels. 3. If making several muffin flavors to serve on the same platter, here's how to make them easier to identify. After adding batter to muffin cups, place a piece of chopped fruit (or whole or halved berries) on top of batter before sprinkling with sugar. The fruit will be visible on the baked muffins, making them easier to identify. If you love the big, tender muffins from a bakery but haven't been able to master them at home, then this recipe is for you. 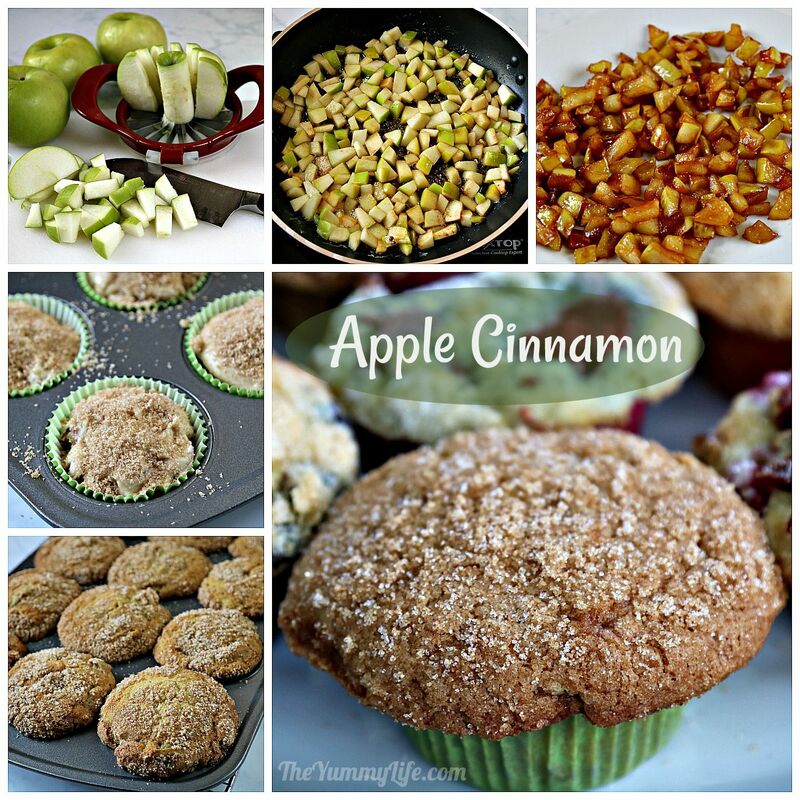 I worked on this recipe for several weeks, making many batches of muffins and experimenting with different ingredient combinations. The hard-working team at my sons' company, LACRM, were more than happy to be my tasters as I delivered batch after batch of muffins to them. 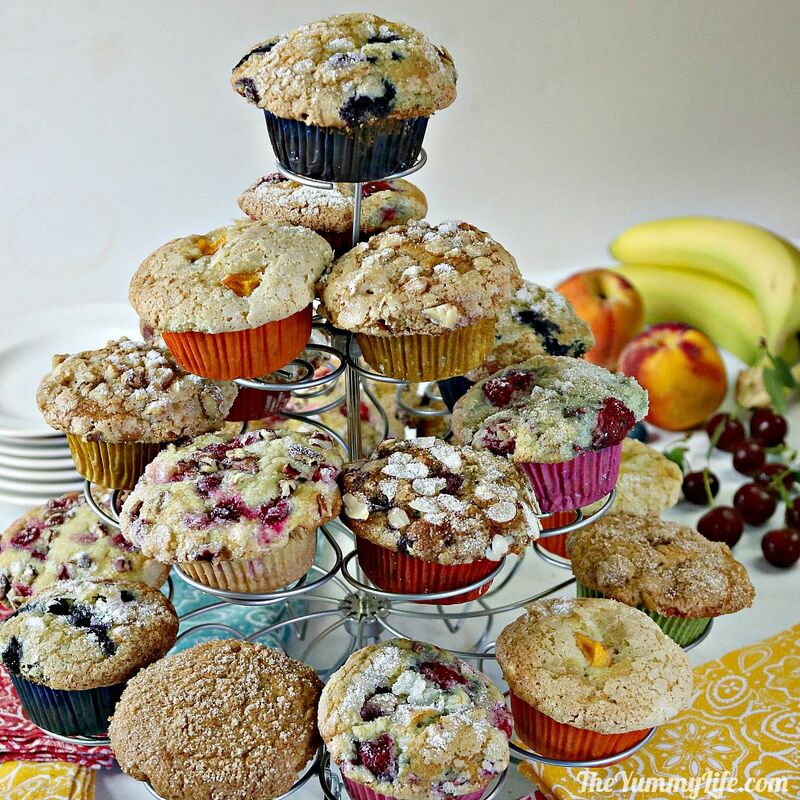 They sampled many fruit flavors and ingredient combinations until, with their help, I settled on the best muffins I've ever been able to make in my home kitchen. 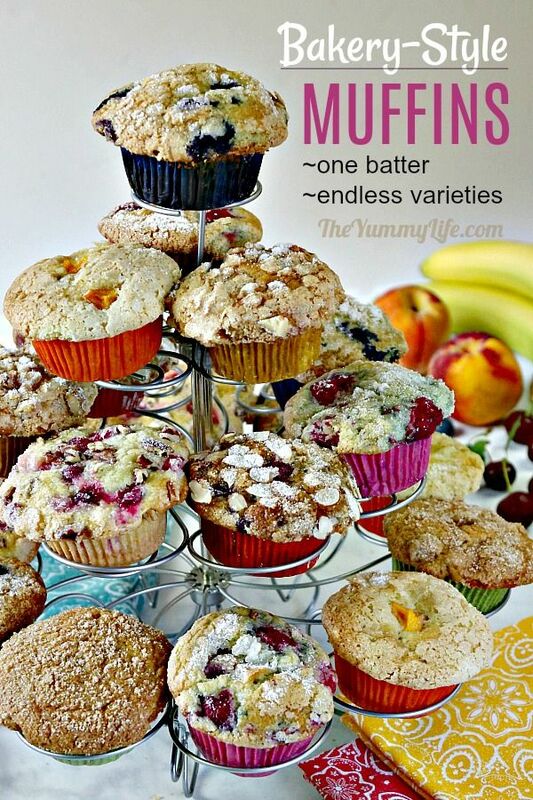 If there's a muffin flavor you want to make that isn't included here, you can customize this recipe for other fruits and flavors, too. 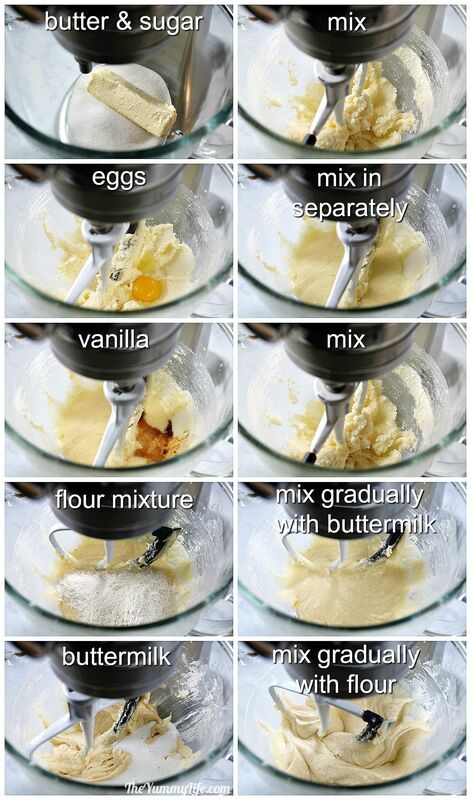 I'll begin by showing you how to mix up a delicious basic batter that's used for all muffin flavors. 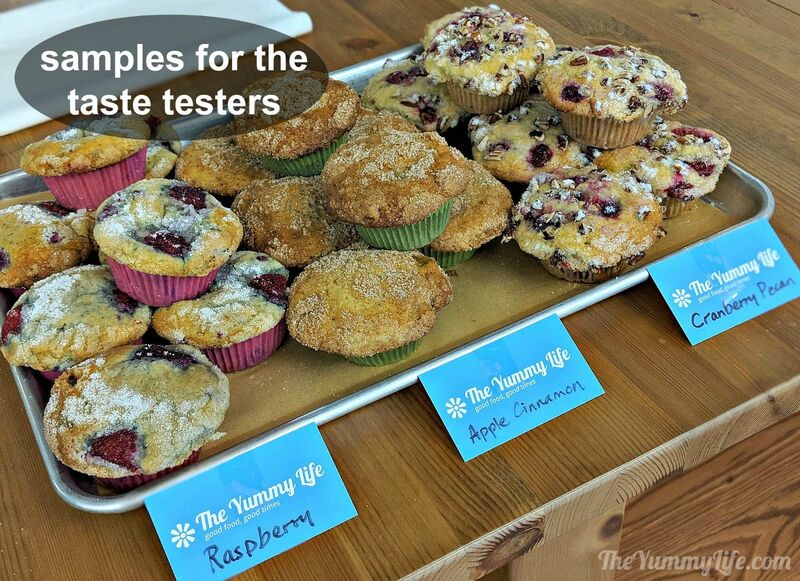 Then I'll demonstrate making blueberry muffins step-by-step, followed by easy adaptations for 7 more varieties. 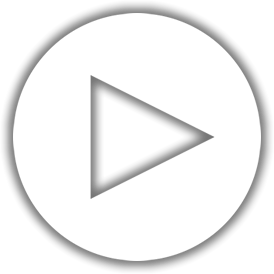 This post is a long one--not because it's difficult but because I demonstrate so many variations. You can jump right to the recipe if you want to skip my photos and explanation. flour -- All-purpose flour is most commonly used, and it works fine. However, if you do a lot of baking, it's worth buying pastry flour for a more tender, bakery-like muffin. Fruit of your choice -- Fresh fruit is recommended, if available, for better texture and flavor. Canned pumpkin puree is one exception--it's convenient and results in pumpkin muffins with perfect flavor and texture. Nuts are optional. I have some family members who don't like nuts and others who do. So, instead of mixing nuts into the batter, I sprinkle them on top of some of the muffins--that way I can easily make some with and some without nuts. Step 2. Prep the fruit. A portion of each of the fruits is mashed like the blueberries and peaches pictured below. 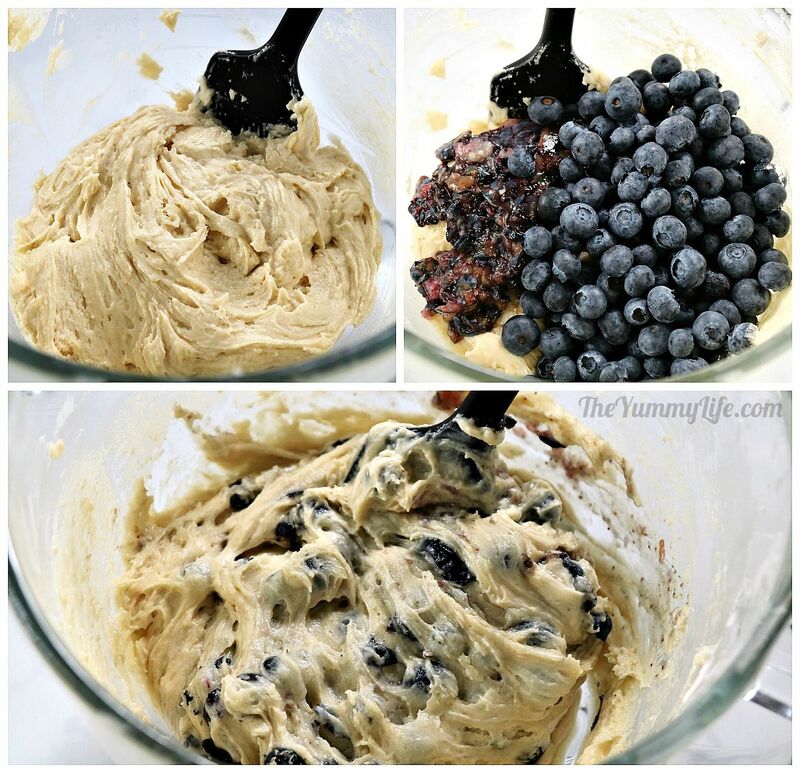 (For example, blueberry muffins have 2 cups whole blueberries and 1/2 cup mashed blueberries. 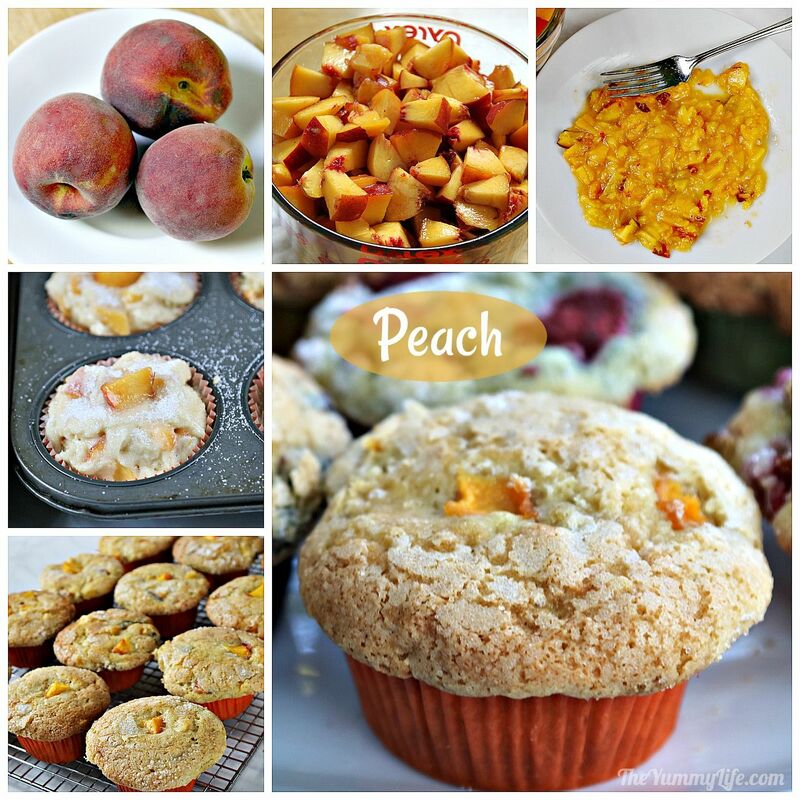 Peach muffins have 2 cups chopped peaches and 1/2 cup mashed peaches.) The mashed fruit serves to distribute the flavor throughout the muffin. 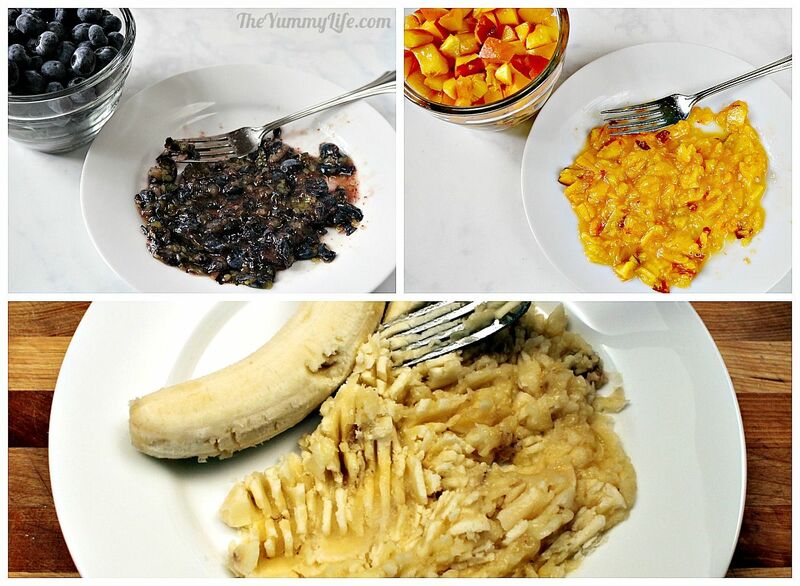 Bananas are completely mashed before adding them in. The complete recipe explains how to prep different kinds of fruit before mixing them into the muffin batter. Next, make the basic batter that is used as a base. Step 3. Combine the dry ingredients--flour, baking powder, baking soda, and salt. Whisk them together and set aside. Step 4. Combine the wet ingredients. 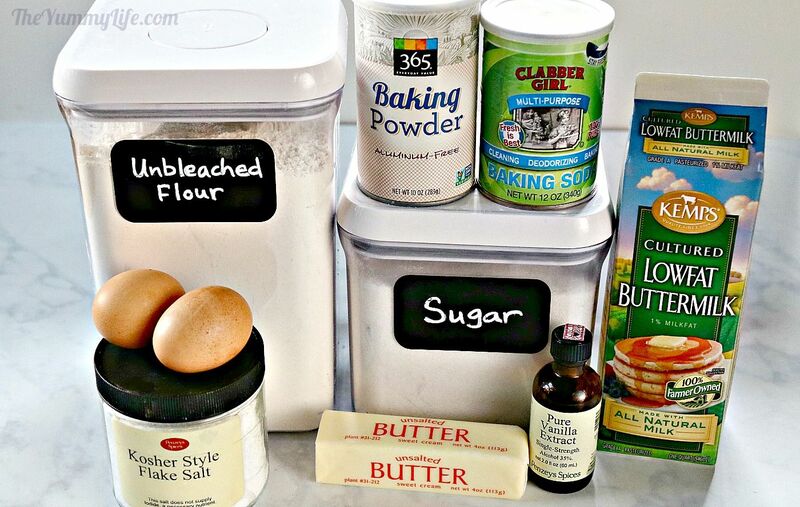 With an electric mixture, mix the butter and sugar on medium-low speed until light and fluffy. Then add eggs one at a time, mixing in completely after each addition. Add the vanilla and mix completely. Step 6. Gently fold in the whole and mashed fruit, just until evenly combined. Blueberries are pictured below. TIP: Fresh berries are preferred, but if you use frozen berries, thaw, rinse well, and dry thoroughly on paper towels before folding them into batter, leaving them all whole (don't mash any). They are softer and more delicate than fresh berries, so be especially gentle when folding them in. Step 7. 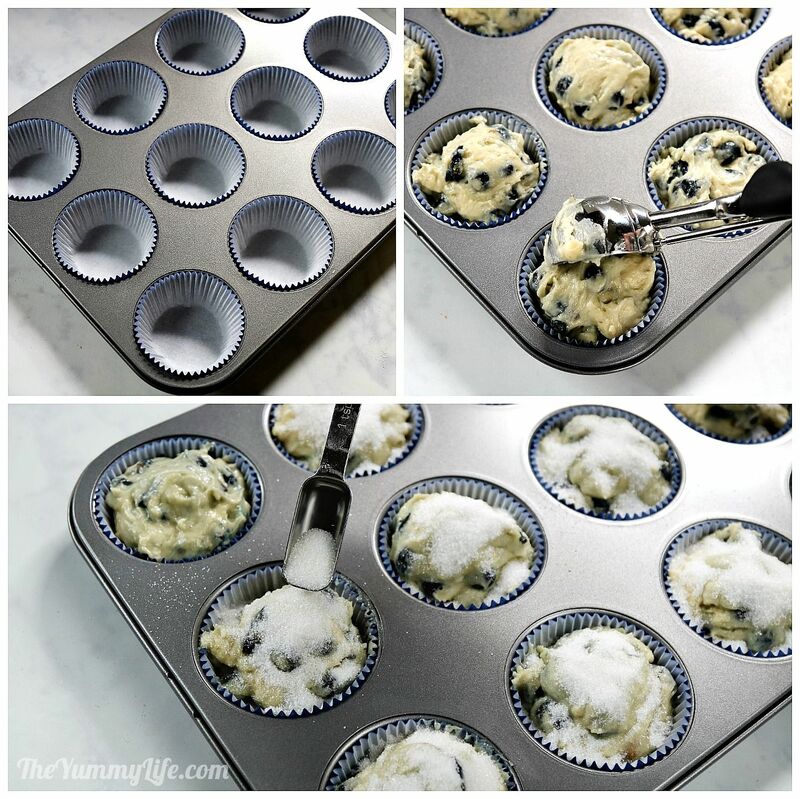 Line muffin pan with paper liners, or spray each cup with cooking spray. Use a scoop to evenly fill muffin cups. The batter will fill each cup and slightly mound over the top. Step 8. 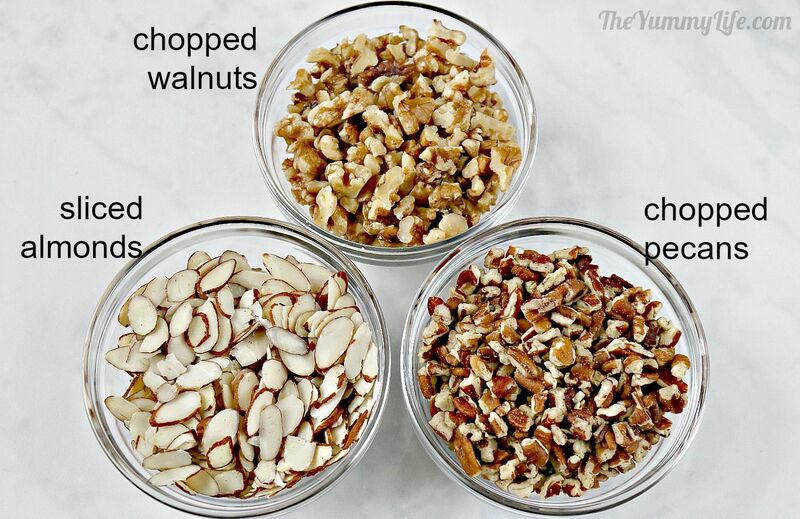 If you're adding nuts, sprinkle them over tops. Then sprinkle tops with sugar. The sugar will form a delicious, crunchy crust on top when they bake. Yum! Step 9. Bake the muffins, removing them from the oven when they are browned and a toothpick inserted in the center comes out clean. Leave them in the pan for 5 minutes before transferring them to a baking rack. 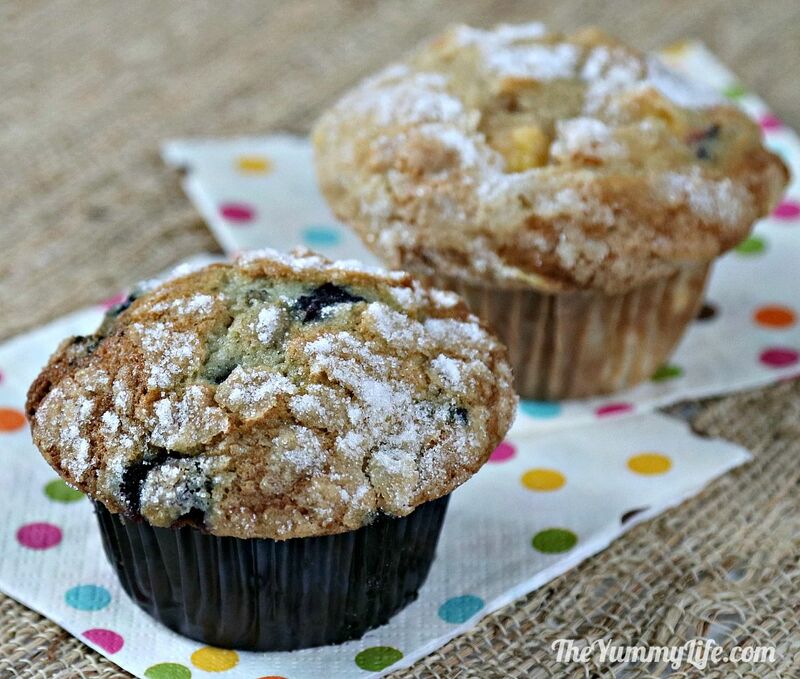 Those beautiful blueberry muffins are the best! Blueberry muffins are hands-down the most popular flavor of them all, but there are so many more delicious varieties to choose from. Here's how to make 7 more fruit varieties. They all use the same batter and basic instructions with a few modifications. Don't mash any of the berries before folding them into the batter. These berries are fragile and some will break apart as they are folded in, so there's no need to mash any of them in advance. If blackberries are large, cut each one in half before folding into batter. 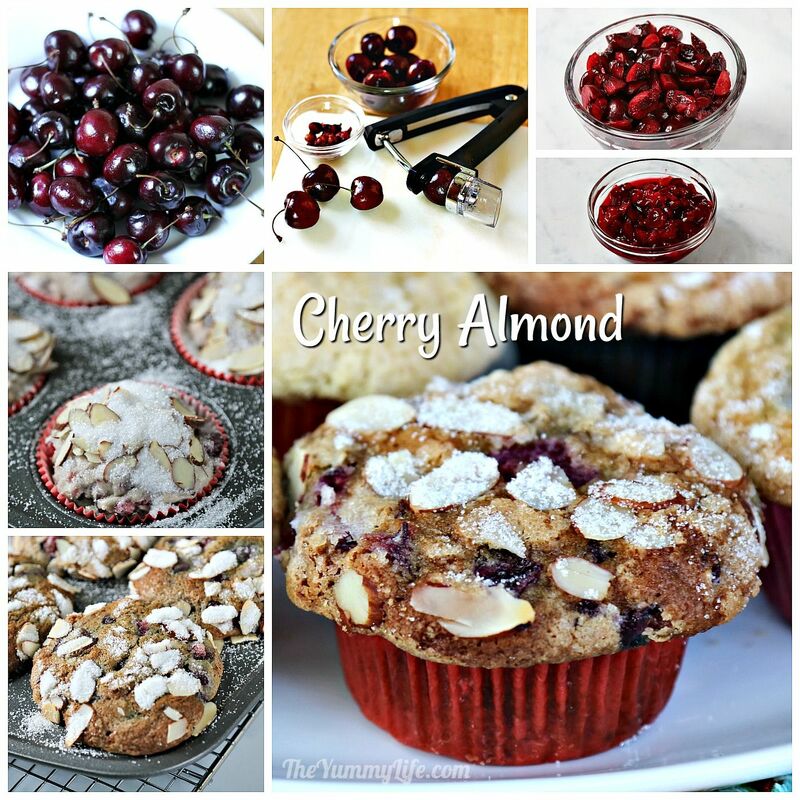 Cherries are also a stone fruit and are made like the peach muffins above. Pit the cherries and mash a portion of them with a fork, or dice them with a knife if they're too firm to easily mash. Batter modifications: add cinnamon to dry ingredients and substitute almond extract for the vanilla in the wet ingredients. Optional nuts: add sliced almonds to tops of muffins before sprinkling tops with sugar. Batter modifications: add cinnamon and nutmeg to dry ingredients. Use very ripe bananas, and mash them all with a fork before folding into the batter. Optional nuts: add chopped walnuts to tops of muffins before sprinkling tops with sugar. Precook the apples! (This is an added step, but it improves the flavor and texture of the apples significantly.) Chop unpeeled Granny Smith apples and brown them in butter, brown sugar, and cinnamon, stirring often. Allow them to cool for at least 10 minutes. Fold the browned and cooled apples into the basic batter. Optional nuts: sprinkle tops of muffins with chopped pecans. Sugar topping modification: combine granulated sugar, brown sugar, and cinnamon, and sprinkle it on top of the muffins before baking. Cranberries are very tart, so first sweeten them with some additional sugar. In a small bowl, combine whole and mashed cranberries, sugar, and zest from one orange (zest is optional). Set aside to macerate for 30 minutes before folding into batter. Optional nuts: add chopped pecans to tops of muffins before sprinkling tops with sugar. Make mini muffins, too! This recipe works just as well for 24 mini-size muffins. They're an especially good size for snacking or serving at a brunch or breakfast. The smaller size allows people to try more than one flavor, if they like. They're also a great size to share at work or a pot luck. 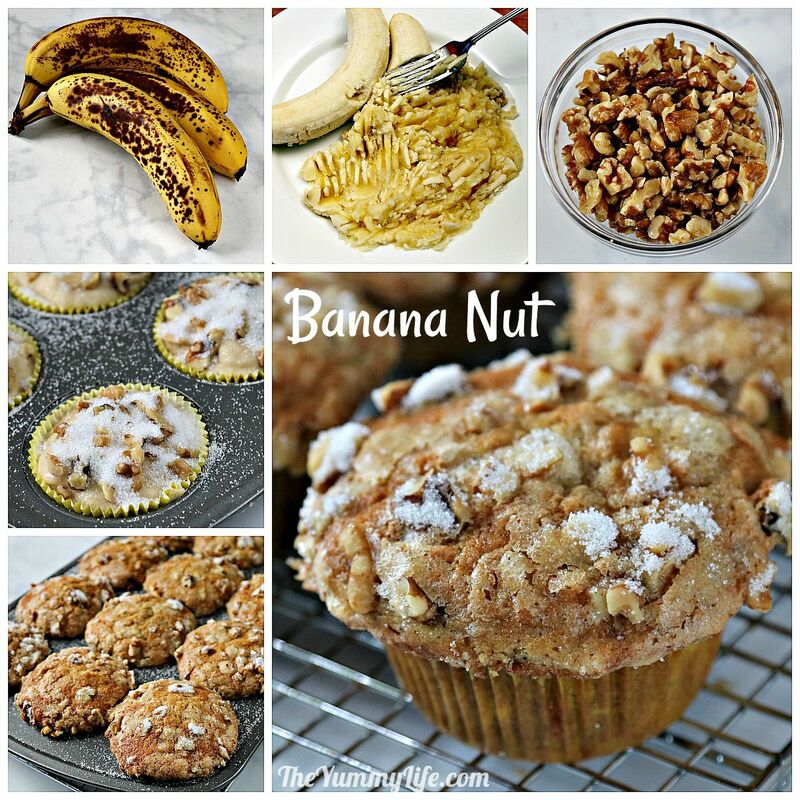 Mini banana nut muffins are picture below. 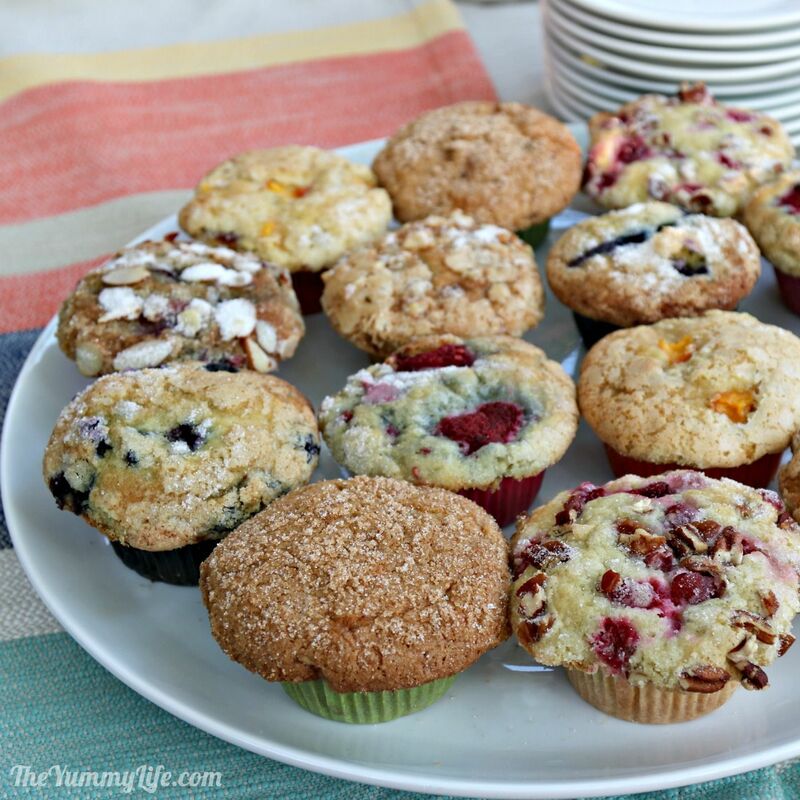 To store the muffins, leave them uncovered at room temperature or cover them lightly with a dish or paper towel. Or, put them on a plate inside a paper bag. DON'T put them in a sealed plastic container, or you'll end up with soggy muffins and you'll lose that delicious sugar crust on top. I was surprised to find that these muffins are almost as good the 2nd day as when they are freshly baked as long as they are stored properly. By the 3rd day, I needed to zap them for 10-15 seconds in the microwave to bring them back to life. Make this master recipe your own! Customize the basic batter with other spices, extracts, fruits, or a combination of fruits. Try stirring in 1/2 cup mini chocolate chips or raisins--how about an apple raisin combo or pumpkin with chocolate chips? The possibilities are truly endless. If you decide to add some stir-ins, reduce the amount of fruit by an equal amount--this will keep the ingredients in balance so you will have the right consistency and volume for 12 muffins. At last, bakery-style muffins at home! 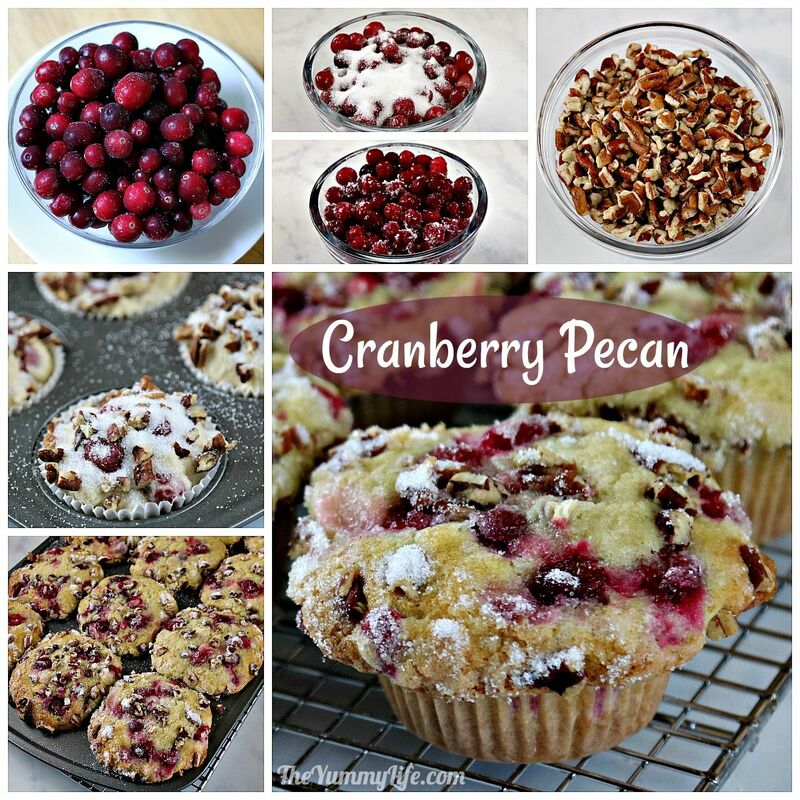 This versatile recipe has resulted in so many tasty muffins from my oven lately. It's hard to pick a favorite. I particularly liked pumpkin, peach and blueberry. The taste testers especially raved about the peach and raspberry. It's a personal preference thing, to be sure. Please share in the comments section below if you make a batch with a different flavor. I'd love to hear what other muffin flavors people create.